1. Education for life. I don’t plan on pursuing academia in the (near) future, but I love having the ability to pursue my intellectual interests even while I’m out of school and knee-deep in diapers. I’ve attended events with Marilynne Robinson and David Mitchell, meeting the former awkwardly and silently. I audited a class on St. Bonaventure while I was pregnant. I also can’t emphasize enough how fun it is to be around conversations about the higher things. 2. Cool people. We went to a barbecue hosted by a grad student ministry at Yale and a world-renowned philosopher commented wistfully about how amazingly intricate Christopher’s baby ears were while holding a burger. I have several of these stories and I have to laugh at our minor brushes with greatness. Not everyone is a world-class academic, of course, but I think listening to anyone talk about what they love about their field is cool. Generally, universities attract people serious about their faith, a fact which makes the Christian community inviting and challenging. In fact, the NYT recently wrote about the revival of the Christian study center. This community is crucial. I don’t have contact with people in class like Chris does, but when there’s a strong Catholic community? Bam, instant friends, even for those of a hermit temperament (me). Our parish is thoughtful, intentional, and welcoming (and run by the academics of the Catholic world, the Dominicans #aquinas) and it’s surrounded by Yale’s campus. While many, if not most, of my parish friends are not affiliated with the university, it’s cool to be in that position. I also attend a playgroup for toddlers of moms at Yale and I’ve met women from all over the world: Norway, China, Brazil, Colombia. It’s pretty cool to meet such an international crowd on Tuesday mornings in a church basement. 3. The library. My spouse ID gives me library privileges and it rules. I know it’s because we’re at Yale where the endowment is bigger than the budget of some small countries, but I have always been able to find any book I want through the university library. What if they don’t have it? Oh, I just ask any other Ivy League school to send it to me. What if they don’t have it? Oh, I just ask Yale to buy it for me and, bam, four days later, it’s in my clutches. Chris and I also take frequent advantage of the movie collection and the assortment of board games stocked by the law school library. Free date nights! 4. Flexibility. Chris gets a lot of time off for the holidays. A lot. And all summer. We were able to spend a month with my family in California last summer and two weeks with them over Christmas. Day to day, Chris has some flexibility too. I try to respect his self-imposed 40-hour workweek – which is good for us because he tries to keep schoolwork and home relatively separate – but if I have a doctor’s appointment or something else essential, we don’t have to spend money we don’t have to hire a babysitter. 1. Transience. I’m so, so excited that my husband gets to spend his time contemplating things he loves (and, honestly, subjects I find very interesting too), but since he’s been successful so far (woe 😉 ), it means we might have to move next year as he begins a PhD program. I feel like I finally hit my groove in New Haven this year. We got more involved in our parish (which got an awesome new pastor last summer) and developed deeper friendships. It hurts to think we might be leaving in a few short months just when I think we’re getting started. It’s a whole blog post worth of feelings, but I’ll just say briefly that it is hard to juggle wanting the best for my husband’s career and vocation with the desire to stay planted and grow with the community we have here. Of course, nothing is certain and we could be here next year (or the next seven years), but still, is very likely we’ll have to leave eventually. 2. Money, or lack thereof. My husband is still in his Master’s program, so, while he’d make some sort of stipend in a PhD program, right now we are paying for him to go to school. Thankfully, he has a generous scholarship, the Lord blessed us with an insanely helpful (free!) housing situation, and we both have part-time jobs that we enjoy, but we still live very frugally. We’re thankful for this in a lot of ways: we’re developing habits of detachment from wants; we’ve learned to follow a budget; we get creative with hospitality and our own date nights. But it’s still hard to not have pocket money for, y’know, crafting whims and, to a greater degree, to feel like we can’t give as generously as we would like. 3. Uncertainty. Since Chris turned in his PhD applications, I have not been the most successful at cutting off rabbit trails of what if. What if we move there? Can we buy a house? Is there a faithful Catholic community? Will I make friends or become a hermit again? This attitude is not limited to the academic life, of course, but the paucity of academic jobs in the humanities makes seven years down the road another haze of unknowns; however, all of this worry is an opportunity to trust the Lord, who brought us this far. He’ll take us where we need to be. We’re sure of that. Linking with Kelly for Seven Quick Takes! Hello! Great post :-). “Academic” parishes are wonderful, aren’t they? I think the only people I’m still in touch with from university days are Catholic… including two of the chaplains (Domincans. Oh yes.). Hope you get some answers to your questions in the very near future! Indeed, our parish (and the Dominicans!) have just been fantastic. We entered the Church at our parish here and got some good Thomism in our RCIA. 🙂 Thanks for stopping by! Sending prayers for you guys! Excited to hear how your next step turns out. 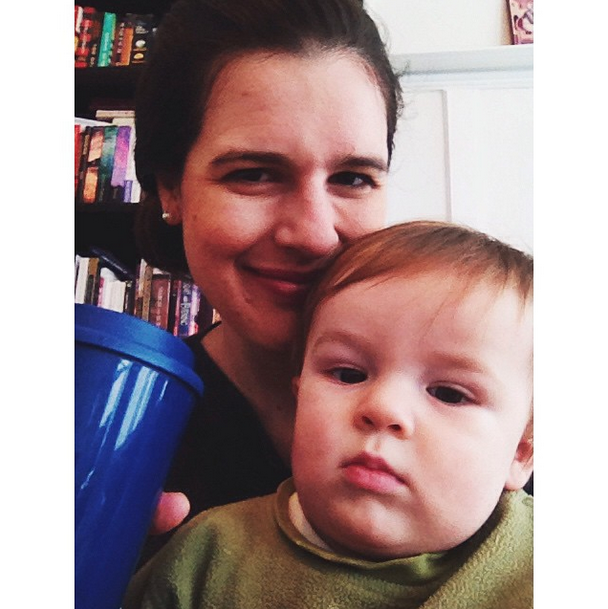 I am a grad school wife too and am so glad I found your blog (7qt for the win)! I’ll be following your journey as you guys transition; all the best! Yay, so happy to have you here, Heidi! I love connecting with other grad school wives. Thanks for reading! I might make my husband go back to school JUST so I, um, he, can have those library privileges!!! Here I am buying all these second hand books on Amazon like a sucker! Great post!! I am looking at going back to school in the next year, which is scary. It is hard to shake up our families normal and tighten the belt more. Your positives remind me of all the great things that come along with this change. Thanks for writing.